It has been a great couple of years for the Pakistani film industry. We’ve finally gained some solid footing and have managed to get audiences excited about Pakistani films. Dukhtar, Moor and Saawan have received critical acclaim for being sensitive, powerful films, whereas commercially successful ventures like Na Maloom Afraad, Actor in Law, Punjab Nahi Jaungi and Jawaani Phir Nahin Aani have attracted large audiences to the cinemas, which has been, especially for Pakistani movies, a rare occurrence in the past. Not only is there a gradual progression in quality, script and cinematography, there is a definite increase in the volume of films being produced. All in all, things are looking up for the Pakistani film industry. The industry itself has changed for the better as well. Thanks to social media and multifarious channels, our actors, directors and other crew members are now exposed to raw public opinion, and lots of it. They are bombarded with opinions in a much faster way than they were ever before, and it often becomes a test of their courage and patience that they now have to survive in an all-changing, volatile, fast-paced communication medium. Not only do they have to survive, they have to remain relevant. Older film actors and actresses have a tougher time utilising and navigating through social media. Where in the olden days these celebrities would be able to get away with saying anything to anyone, social media, a great equaliser, is a much harsher judge. And as the adage goes, “The internet never forgets”. Because hello, screenshots. 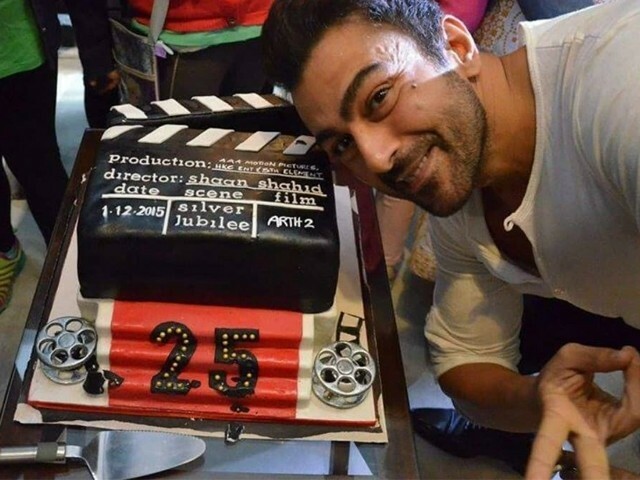 Shaan Shahid, Pakistani film star and controversy’s oft-favourite child, has a film in the theatres these days, titled Arth 2. Inspired by Mahesh Bhatt’s film of the same name, the film is written, directed and produced by Shahid himself, and I find it lovely and refreshing that he’s actually doing soulful, romantic movies instead of war films where he was often, as I like to call him, Commander Killjoy. I have been a long-time fan of Shahid, despite his various comments and controversies. I remember my breath catching in my throat when I saw his beautiful face sprawled across the billboards in Karachi for a mobile company ad. Shahid’s star power is as irrefutable as it is massive. But at the end of the day, what Shahid, or his managers, as he insists, have been doing with his social media platforms is nothing less than appalling. As a film star who has thousands of followers on Twitter, Instagram and Facebook, Shahid often takes to these platforms to ‘connect’ with his fans. And of late, in lieu of connecting, he usually ends up spewing extremely politically incorrect balderdash. The internet, however, like the North, remembers. First, Shahid’s films Yalghaar and 021 did not fare well critically. Then, a couple of years ago, Shahid bashed Mawra Hocane for supporting the Bollywood film Phantom, and called for the #BanMawra campaign. He also lambasted many actors for going to India to act in Bollywood films. Yet here he is, basing his own production on a Bollywood film. Of late, he has been bashing ‘reviewers’ and bloggers for giving his film bad reviews. Ironically, Shahid is himself found retweeting and sharing problematic opinions on his social media pages. Why should I fire him ? Just because somebody didn’t like what he tweeted ? How cruel is that . Try sacking people who took your freedom , future, and your vote !! !..I I don’t think so. It is perplexing to see why Shahid is behaving the way he is, and has in the past. Is it because he is afraid of his film crashing? Does he think he can bully people into saying nice things, or does he honestly not understand that everyone on social media may not necessarily subscribe to his opinions? The film, and media industry in general, is a brutal, volatile business. It makes and breaks people within minutes. The process has especially accelerated and is more open to the public since the advent of social media and communication technology. The idea of a celebrity culture has taken a different shape and meaning, and stars are now often made by the kind of connection and engagement they have with fans and other stars on social media. This is why managers are expected to know how to handle these situations and not tick off people who disagree with them. However, Shahid has not gotten the memo, and instead insists on riding this social media wave in the most old school way possible. So dearest Shahid – your fans love you and believe me, we want to continue loving you. But you can’t treat people like this, you absolutely cannot. The 90s are over. The days of the angry Jutt are long gone, and while your bullets will definitely not kill any villains like they did in your movies, your social media posts will surely kill the hero in our hearts that we have loved for so long. When your “trusted” male servant is caught molesting your little girl, what can you do as a parent? What is a film critic? Someone who expresses personal dislikes and likes about a movie and forces their view on others by writing about it. Film -makers have a legal case for suing them for any financial loss suffered as a result. Most of the critics seem to have been brought up on Bollywood and therefore by definition emotionally immature and mentally incapable of supporting the Pakistani film industry. Sorry. I do not follow exactly how the film critic “forces” their views on others? Many movies that have been passed by critics have become blockbusters in both Bollywood and Hollywood. Also, what would be the basis of the legal case? After all, if critics are emotionally immature, readers will ignore their opinion and see the movie anyway, right? Perhaps both can learn from each other. Everything-else in that comment was within the context of Pakistan. A wild review uses soft language whereas a ruthless review is provocative and forceful. The way Pakistani critics write a defamation case can be built against these critics.